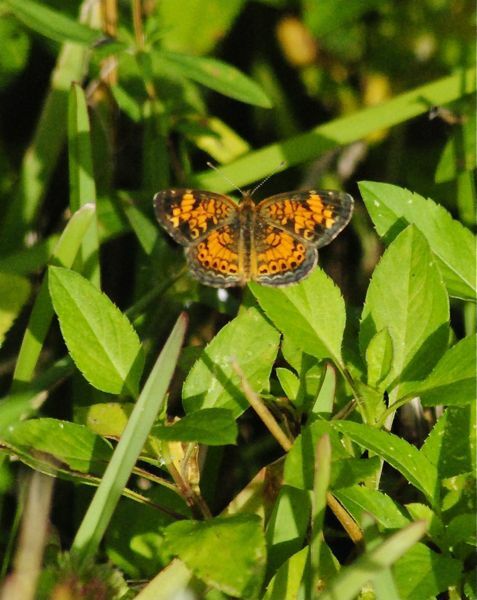 A pearl crescent butterfly, photographed at Loxahatchee National Wildlife Refuge in January 2015. 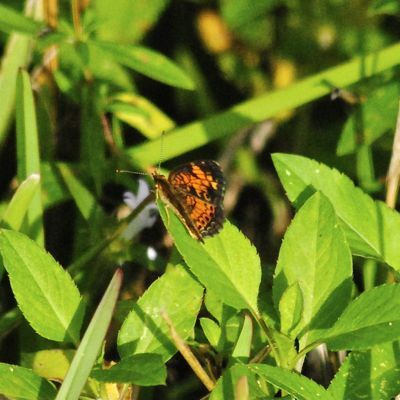 The pearl crescent butterfly, Phyciodes tharos, isn't big, and it tends to fly low to the ground where it can be difficult to see. 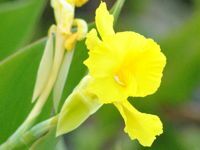 But its oranges, blacks and browns will grab your eye if you're looking anywhere near its direction. 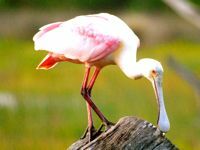 Pearl crescents are full-time resident of South Florida, where they're active year round. They can be found as far north and west as Alberta province in Canada, through the Rockies to California and over the eastern United States and into southern Canada. Up north, it flies April to November; when it starts to turn cold, the larvae turn into a sort of suspended animation called diapause until temperatures start warming up again in the spring. 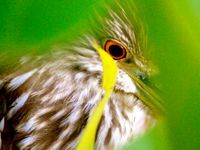 It has a wing span of about 1.25 to 1.75 inches, with females slightly larger than the guys and also more boldly colored. 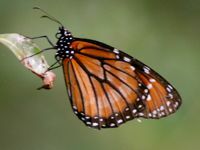 Looks can vary in the adults, depending on the time of the year when they hatch but they are generally orange with black borders above, light browns underneath. It seems the length of the day is the determining factor and not temperature or available food. Pearl crescents looks similar to phaon crescent butterflies, Phyciodes phaon, but there are a couple of differences that make it easy to tell the two cousins apart. The easist, for our eyes anyway, is the creamy-white line phaons have in the mid-point of the forewings. Two other crescents, the tawny and the northern, also resemble the pearl, but neither is found this far south. Pearl crescent adults aren't picky feeders. They'll nectar on a wide range of flowers, but especially dog bane, swamp milkweed and Spanish needle. Asters serve as host plants for the caterpillars. 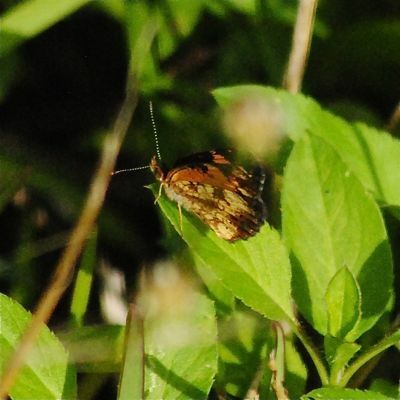 Females will lay a small cluster of green eggs on the undersides of the leaves. the hatched young will feed together within a silk web. Gradually, they become less social creatures until they are completely on their own. 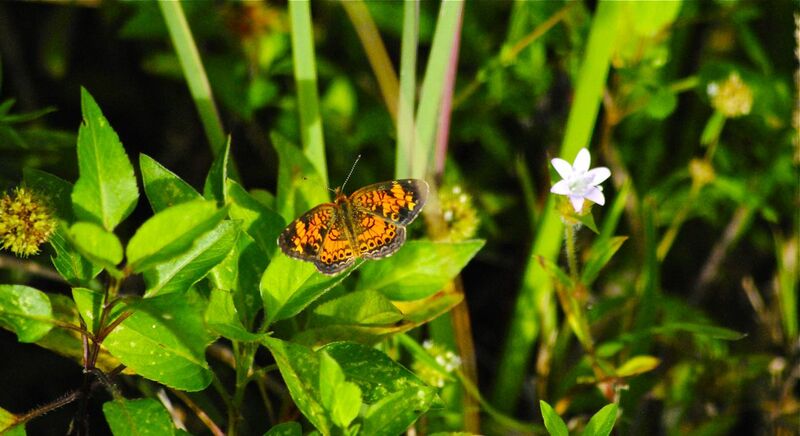 Up north, the pearl crescent will produce two generations a year; here in Florida, there can be as many as four. As we noted earlier, pearl crescents tend to hang near the ground, perching on rocks or low-lying vegetation as the guy we photographed is doing. They like open areas, including roadsides, fields, pastures and open pine woods. 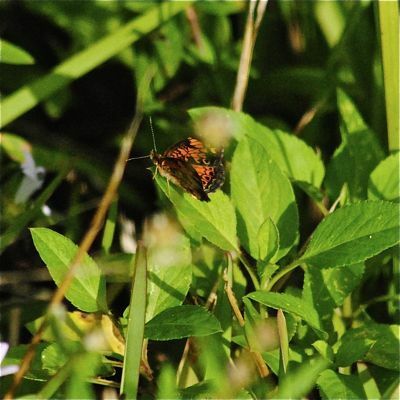 They will visit puddles, and males will defend "their" puddle from other males of the species and even dart after other butterflies, especially if females are using the same puddle. 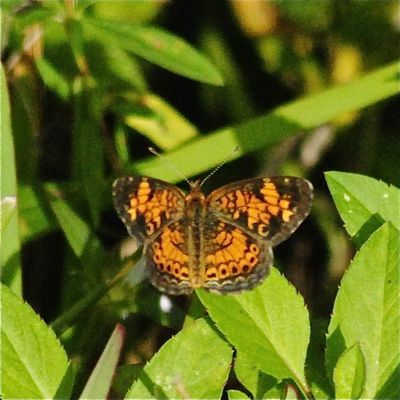 Pearl crescents are abundant in the eastern U.S., some say it's the most common butterfly in the country, although they can be rare on the margins of their range. 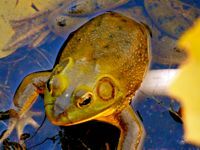 It is a member of Nymphalidae, the brushfoot family.